Did you know that elephants have exceptional memory and never forget a face? It’s true. So how does this fact serve as an overarching metaphor in Jackob G. Hofmann’s A Persistent Memory? Thinly, of course. Elephants and grief are all the focus in Hofmann’s slow-moving drama about memories. 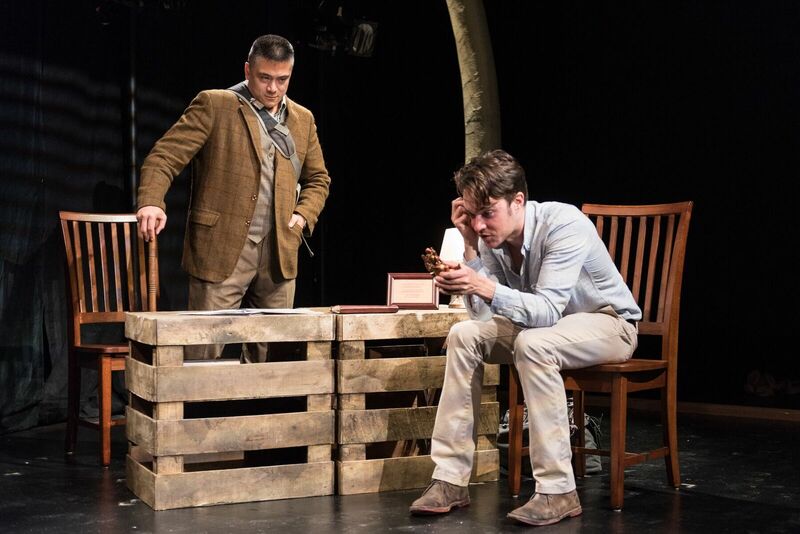 Staged at the Beckett Theater at Theatre Row, A Persistent Memory follows David Huntington, a rich kid finds himself in Uganda to research elephants only he doesn’t know why. Told nonlinearly, A Persistent Memory pieces together moments to offer a muddled message. After the suicide of his brother a year earlier, David begins to forget. His triggered memory loss sends him on a journey where it was still hard to piece together the key moments of each beat. When the main character can't figure out why he's doing what he's doing, it’s hard for the audience to figure it out as well. At its core, Hofmann’s drama is about grief and memory. But the overwhelming influence of elephant facts doesn’t aid the moral. Instead, you’re left trying to figure out is it only present for the similarities. Beyond that, the trouble is Hofmann doesn’t do a strong enough job crafting characters. Despite a loveable performer, David is not a loveable character. It’s hard to care about his journey, especially when other characters steal the limelight. We learn more about elephants than some characters. And others are so inconsequential to David’s story, you almost wonder if they’re necessary. Those characters are Elijah, David’s friend and source for his elephant tour, and Carly, Elijah’s violin-playing lady friend. A little before the midway point, the duo has an entire scene with little payoff for the overall arc. The overall arc being David’s story. The only bit of important information is the phone call that Elijah makes to David at the end of the scene. This later comes into play when we learn that Elijah made a pass at David. This inconsequential beat could easily be eliminated to give more focus on a story arc that only exists through conversation: David and his father. We see David and his father’s new wife Marie discuss his father but without his presence it lacks emphasis. And while we’re at it, they say that every story needs a little romance but the intimacy between David and Olivia, his Uganda interviewee, comes out of left field and forces a few face-palms from the audience. Even with the bones that she’s given, director Jessi D. Hill makes the most of the text. While the pacing is inexcusably slow, Hill does try to track David’s journey clearly. Her transitions were lyrical and emphatic until it seemed there wasn’t enough time to stage them and they became messy. Before the start of the show, the stage image was simply amazing. 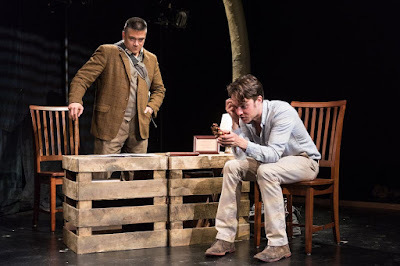 The set from Parris Bradley with lighting designer Greg Solomon highlighting what evoked an elephant graveyard was stunning to look at. And then once the show began and more lights appeared, the bracing of the bones were revealed and the pretty illusion went away. But the proscenium cutout was pretty darn beautiful. Regardless, how Bradley and Solomon worked off of one another was breathtaking. This was a collaboration that was greatly rewarded. The only major woe was that the final moment literally was lost in the darkness. When the audience doesn’t applaud, you know it didn’t work as the button for the show. The costume design by Valerie Joyce was strong for the most part. She paid attention to patterns and palette well. Though there was a moment in the first scene where Joyce seemed to disregard the text. David blatantly states that it’s hot and he’s wearing a long sleeved shirt, a cargo vest, and khakis. While the shirt and pants were part of the base costume, at least have him roll up his sleeves if he’s going to mention the temperature! Miles Polaski’s sound design was quite good. The transitional underscore blended a classical touch with tribal elements that Hill worked into her shifts. Even the internal cues were purposeful. This story was all about David and his journey. Despite the character, Drew Ledbetter offered a solid performance. Ledbetter has a soothing melodic tone in his voice that grounded David. Though Marie was introduced quite late in the show, Lisa Bostnar pulled out the intrigue of the plot. As the new mom at odds with her stepson, Bostnar was sweet. Bostnar and Ledbetter had the strongest chemistry of any duo on stage. Even though his character should have had a show of his own, Richard Prioleau did fine work as Elijah. His flirtatious nature was stimulating. A Persistent Memory is one of those shows that you can see the team put the effort into constructing a strong production but the text was just not up to par, yet. Jackob G. Hoffmann’s play needs a little more work before it’s really ready for the big time.